The University of New Brunswick has created a number of sustainable gardens on its Fredericton campus this month—including wildlife friendly gardens and a medicine wheel garden. The gardens are one of many initiatives under the Engaging UNB Fredericton Campus in Sustainability project that is partially funded through the New Brunswick Environmental Trust Fund. “The project is one of UNB Sustainability’s first steps in reaching our strategic goal to support and encourage active living, wellness and environmental sustainability on campus,” said Danielle Smith, UNB Fredericton’s sustainability coordinator. 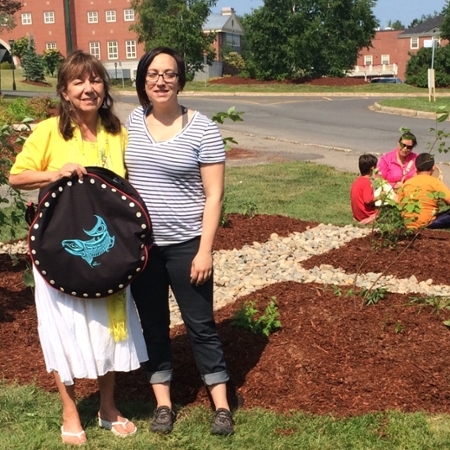 In collaboration with UNB Fredericton’s Mi’kmaq-Wolastoqey Centre and Elder-in-Residence, Imelda Perley, a medicine wheel garden was planted today, in honour of residential school survivors. The garden features traditional First Nation’s plants, used for medicinal purposes. All supplies have a particular connection to First Nation’s culture and practices. The garden is in the shape of the traditional First Nations Medicine Wheel. Children from local First Nations communities assisted in creating this cultural garden that will be used as a teaching tool by the centre for First Nations education courses. The wildlife gardens, which were planted last week, will be utilized as an educational tool for the community through curriculum and local partnerships such as non-profits, daycares and school visits. The hands-on creation and use of these gardens helped foster sustainable behaviour at varying life stages within different cultures. Children from College Hill Day Care and UNB Early Childhood Center assisted in the creation of the wildlife friendly spaces. Nature NB provided them and the campus community with the opportunity to engage in on-the-ground action initiatives that will help protect and conserve local species habitats.